Indications for Use: Alzair Allergy Blocker is intended to treat hay fever and allergy sufferers by promoting alleviation of mild allergic symptoms (i.e., mild nasal irritation including itchy, runny, or congested nasal passages) triggered by the inhalation of various airborne allergens including indoor and outdoor environmental pollens, house dust, animal hairs, and dust mites. Application of Alzair Allergy Blocker produces a mucous-like gel barrier that evenly coats the nasal membranes and acts to block inhaled allergens within the nasal cavity. Alzair particles absorb moisture from the nasal mucosa and swell to create a protective gel-like barrier in the nasal tract. This gel barrier stops allergens from making contact with the mucosa; stopping cell degranulation and the release of histamines from within the body. Squeeze the bottle away form yourself to test the pressure needed to administer an ideal dose. 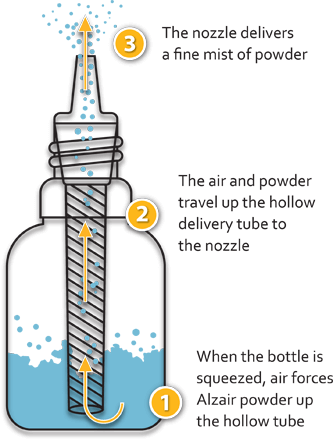 Quickly and firmly push the sides of the bottle together to deliver one "puff" of Alzair powder while gently inhaling. Repeat in other nostril. Keep the bottle and especially nozzle dry at all times. DO NOT RINSE the bottle with water or any other liquid as this may block it. Should the bottle touch the nose or be contaminated by moisture, before replacing the cap, wipe the bottle thoroughly with a clean, dry, unused tissue. Only replace the cap when you are sure that no sign of dampness or contamination remains. Store at room temperature 59-86°F (15-30°C), away from moisture. Alzair Allergy Blocker is intended to treat hay fever and allergy sufferers by promoting alleviation of mild allergic symptoms (i.e. mild nasal irritation including itchy, runny, or congested nasal passages) triggered by the inhalation of various airborne allergens including indoor and outdoor environmental pollen, dust, animal dander, and mold. Application of Alzair produces a protective gel-like barrier that evenly coats the nasal membranes and acts to block inhaled allergens within the nasal cavity. Tell your healthcare provider about all the medicines you take, including prescription and over-the-counter nasal sprays, medications, vitamins, and herbal supplements. While Alzair has no known interactions with other medications, Alzair should always be used after other inhaled nasal sprays and medications.